How to Divide Fractions: from annoying to FUN! 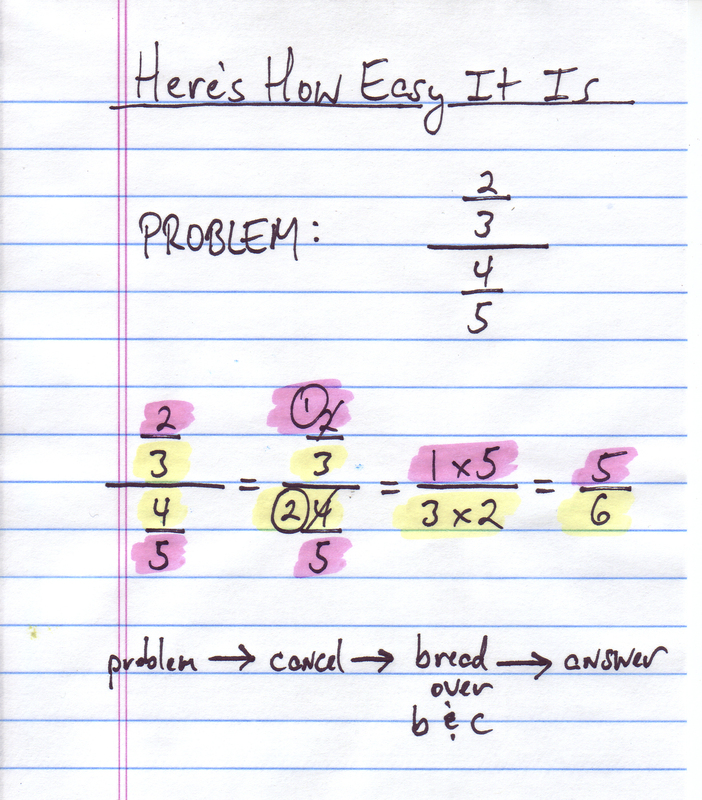 O.K., I’m ready to share my amazing approach to dividing a fraction by another fraction. Well, maybe not breathtaking … like Andrew Wiles’ proof of Fermat’s Last Theorem … but at least interesting. And best of all, fun and student-friendly! 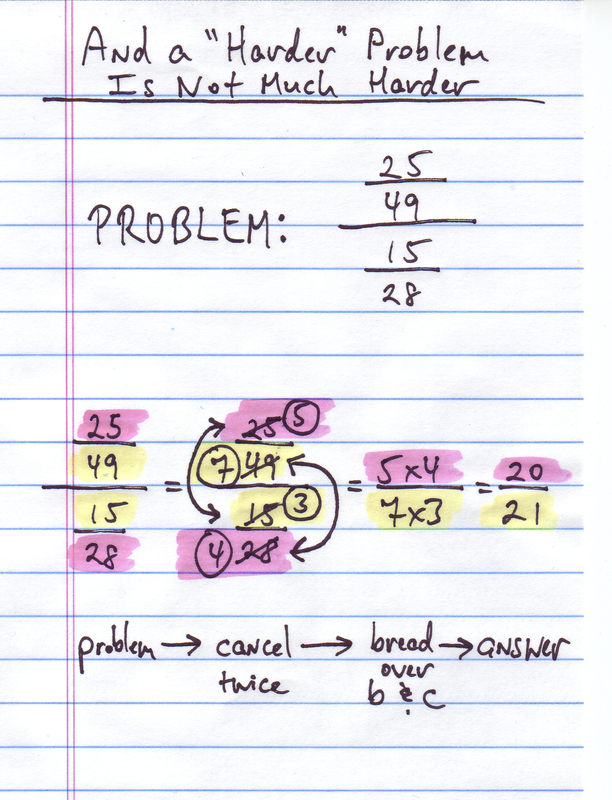 Last week I asked if anyone had any tricks up their sleeves that make it easier for students to divide fractions. And I said that I would share a trick after I heard from you. I got a nice response from Michelle, who said that she has used the mnemonic “KFC” (like the fried chicken), which in her class stands for Keep-Change-Flip. The idea being that you KEEP the first fraction, and next you CHANGE the sign from multiplication to division. Finally you FLIP the second fraction, the fraction on the right. We have similar mnemonic where I live, which goes by the phrase: Copy-Dot-Flip, with the “dot” meaning the dot of multiplication. But what I want to share with you is a completely different approach to dividing one fraction by another, an approach that saves time, and makes it both easier and more fun — in my humble opinion — than the standard approach. 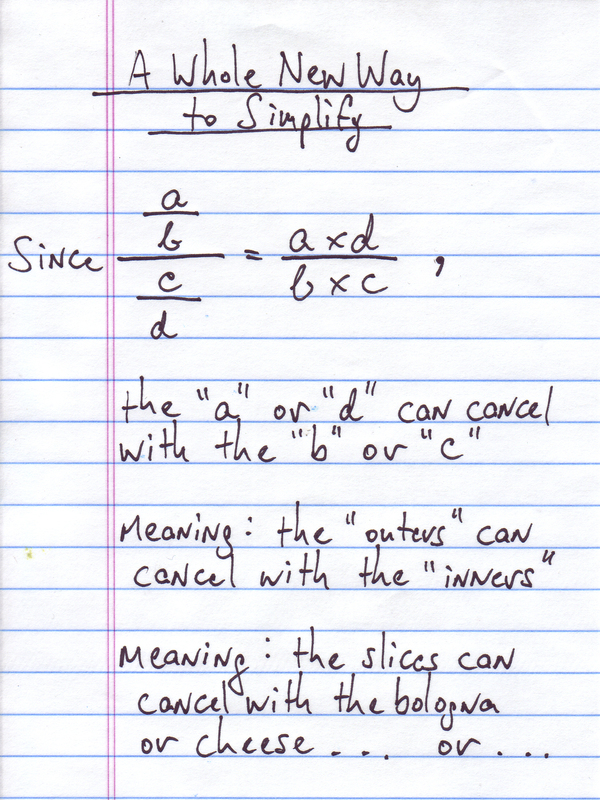 For this blog post, I’m going to limit my chat to complex fractions of the arithmetic type, meaning those with numbers only, and no variables. 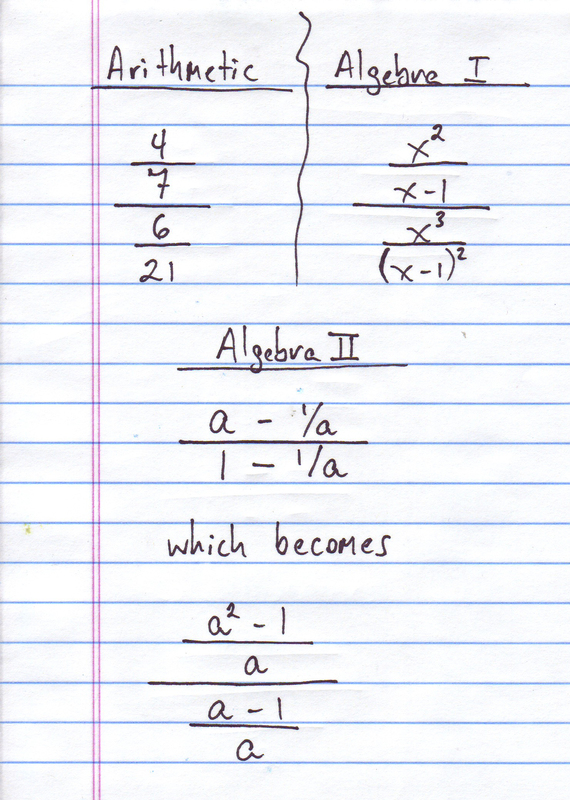 And if it seems important, I’ll do another post later on using this very same process for algebraic fractions. So when you divide fractions in this vertical format, the answer is simply the outers, multiplying each other divided by the inners, multiplying each other. 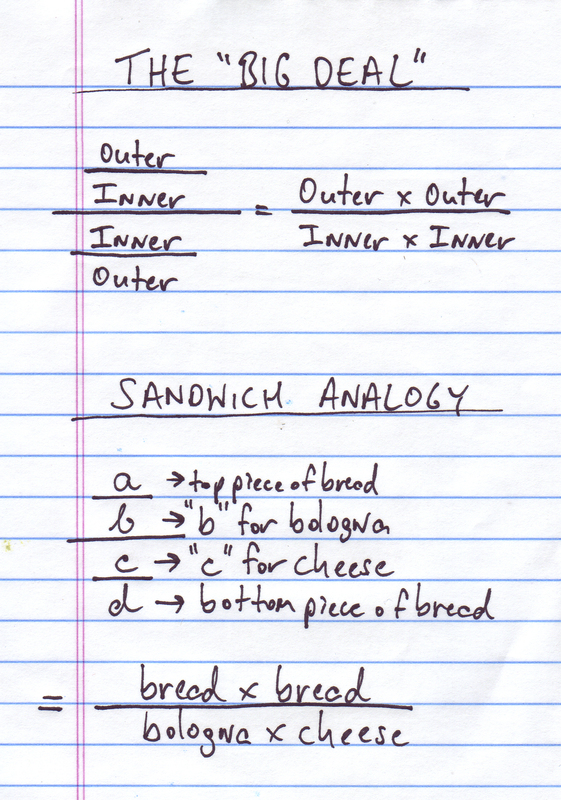 So, to put this in words, the four-level complex fraction that you start out with can be thought of as a sandwich, with two pieces of bread at top and bottom, and slices of bologna and cheese in the middle. 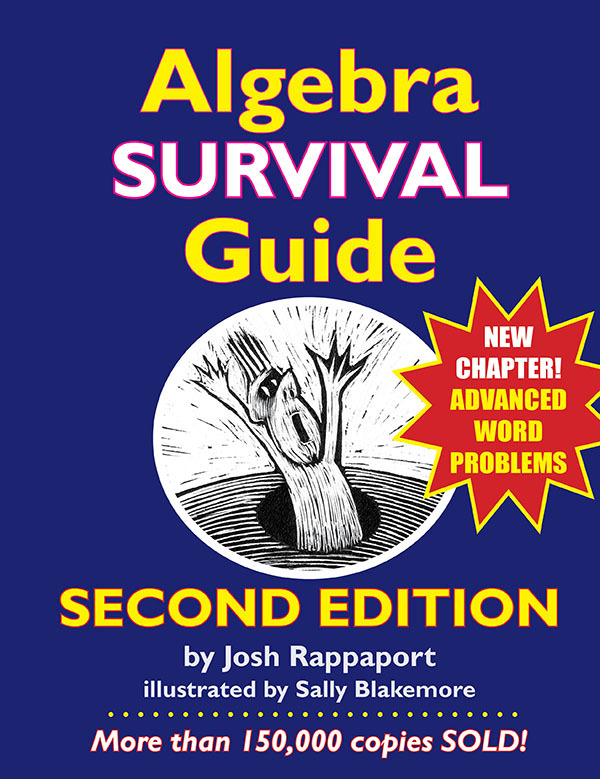 The main point is that to simplify the fraction sandwich, all you need to do is put the two slices of bread together in the numerator and multiply them, And then put the bologna and cheese together in the denominator, and multiply them. 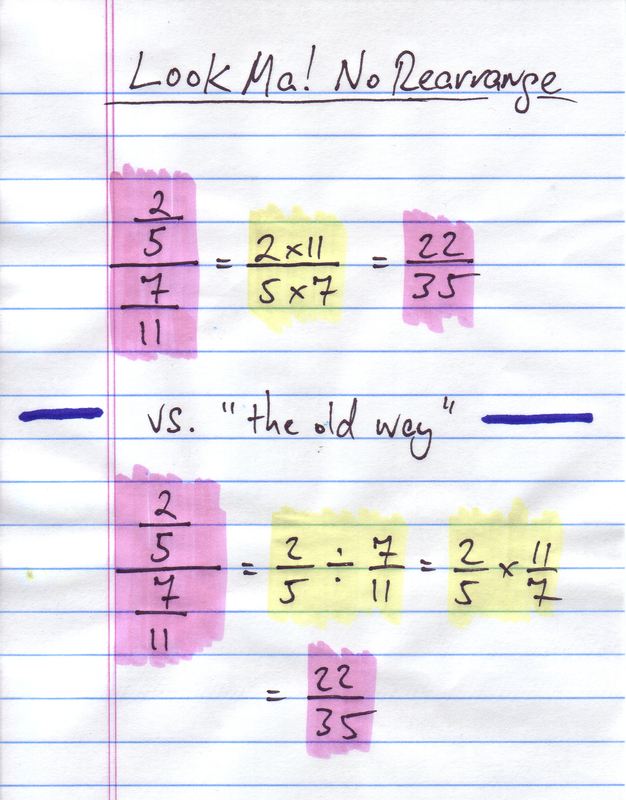 Using this idea it becomes a lot easier to simplify these complex fractions. 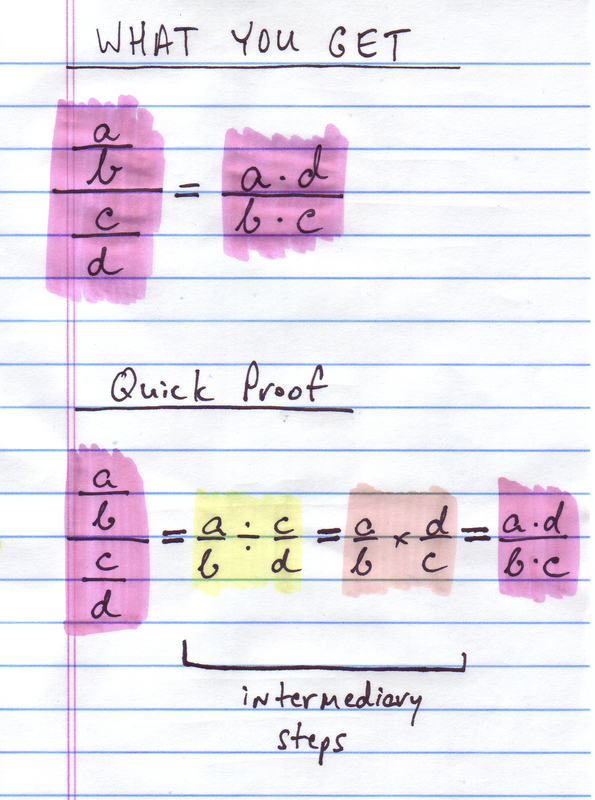 Here’s an image that shows how it is done, and how this approach saves time over the way we were taught to do it, using reciprocals. And there’s more good news. This new way of looking at complex fractions also gives students a cool, new way to simplify the fractions before they get the answer. And when you do simplify fully, the answer you get will be a fraction that’s already completely reduced, so you won’t have to stress about that part. So now you might like to see the whole process from start to finish, so you can decide for yourself if this technique is for you. Well that’s exactly what we’re showing next. 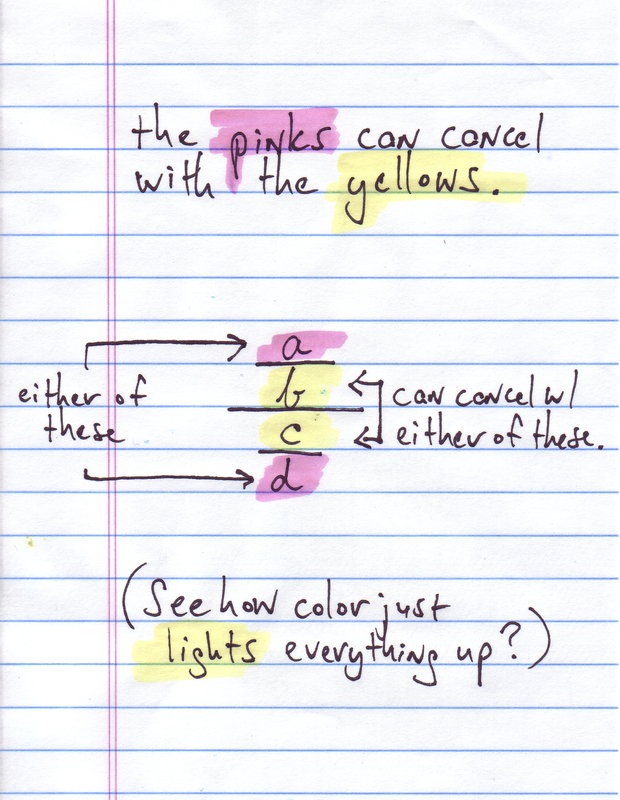 As you can see I consistently highlight the outers with pink, the inners with yellow. And finally, a “harder” problem, you might say. But check it out. Is it really any harder than the one we’ve just done? You decide. In my next blog I’ll give you a few problems like these, so you can get used to this trick, and start shaving precious seconds and nano-seconds off the time it take you to do your homework, so you spend more time doing all of those things that you want to do more: texting, watching You-Tube, taking hikes, skating (roller and ice), etc. etc. , etc. You know better than me.